What is Paintless Dent Repair or Paintless Dent Removal? There are lots of information around the world and there are several ways to define things. For instance, how should we define paintless dent repair. Please read further for the discussion about what’s my take on what is paintless dent repair and what it should be. Paintless dent removal or repair with the paintless method is essentially a combination of methods to remove or restore the metal or aluminum surface of a vehicle back to its original appearance. This is done by manipulating the metal with various tools and techniques. It is an art, to say the least, to be able to move the surface area back to its original form without harming the paint. Although, some people in the internet have painted a picture of it being as easy as using a plunger and a hammer. That couldn’t be more far from the truth on how quality dent repair is truly performed—but there’s more to learn about it. While there are many notions that it can be done with dry ice, I still have never seen a positive result with it to this day. The secret behind mastering paintless dent repair is you don’t ever totally know everything. That is what makes it such an art. Every time I think I know everything there is to know about my profession in paintless dent repair, I learn something new. The method of removing dents by pushing on the reverse side of the panel, where there is a dent, is the way how a dent should always be removed. The introduction of hot glue came into the industry about 18 years ago. The method is done by applying a hot glue from a glue gun on a plastic tab, applied to the outer painted surface, and then pulled with specialized slide hammers or cantilever mechanisms so that the tab is pulled and have the outer surface held down. But this method is mainly designed to pull out the bulk of big dents. There is still a need to finish the dents from the back side with dent tools. The last seven years has introduced new glue pulling techniques along with specialized glue and tabs, which make more complex repairs now possible. It was thought in the past that repairing methods could never be done with glue pulling methods. Deep dents, body line dents, sharp small dents, and even border line collision damage are now able to be achieved. The limits of paintless dent repair, and the ability to do more complex damage with these new method, are becoming endless. As cars have changed and, along with the introduction of H.S.S “high Strength steel”, and as well the introduction of aluminum on cars and trucks that have evolved, so has the art of paintless dent repair and the process involved on how it must be worked on to render a perfect repair. That is why I say, you can never know everything about this craft since the learning curve never ends. Nowadays, the available tools and the possibilities of what can be repaired are getting absolutely mind-blowing. 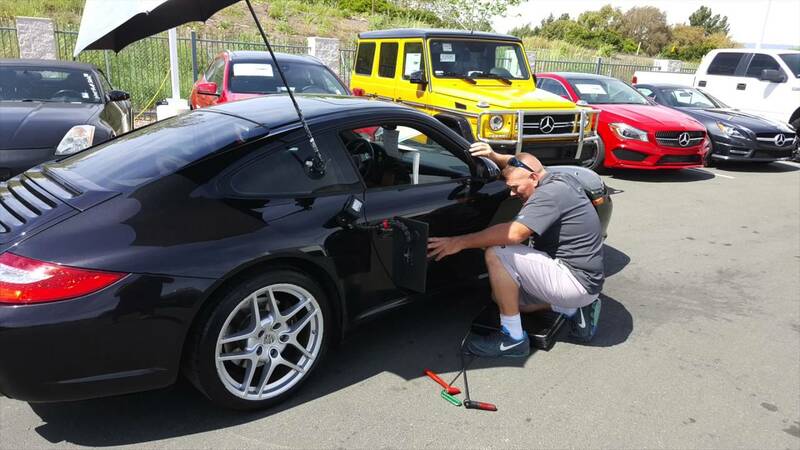 But what I really love about paintless dent repair is—it still takes the person behind the tools to render great finished results.